• Designed specifically for those preparing for city or state Fire Academy. 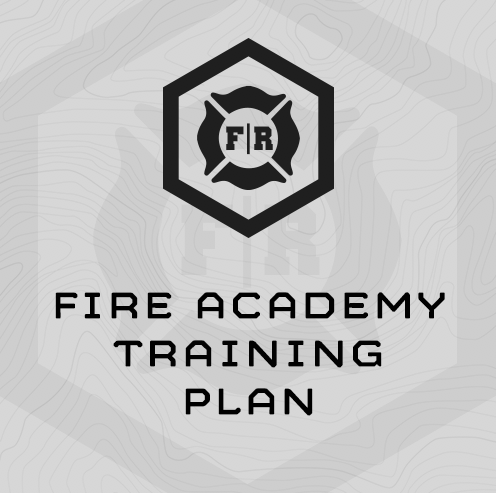 This 7-Week, 5 day/week Training plan is sport-specifically designed to meet the fitness demands of Fire Academies. This training plan is designed to be completed the 7 weeks directly before you report for the academy. Week 7 is an unload/taper week which will allow to report the the academy fit and rested. The program is progressive – it increases in intensity, volume and difficulty as you work through it. Morning PT – Pull ups, push ups, burpees, sit ups and other bodyweight calisthenics, as well as unloaded running at a threshold to moderate pace. Fire Grounds Training – Multiple hours in turn out gear conducing fire suppression, ladder, rescue, emergency egress and other drill. Low Movement – Low crawls and duck walks, especially during fire ground training evolutions. Tower Training – Up and down stairs all day. Sandbag (60# sandbag for men, 40# sandbag for women) MTI sells sandbags here. As well, • you can make your own out of an old duffle bag. 25# Weight Vest (We recommend this one. (2) Max reps Push-ups in 60 sec. (3) Max reps Burpees in 60 sec. (4) Run 3 miles for time. 150m Shuttle = set two cones 25m apart. Set a repeating countdown timer for 1 min 15 sec. On “Go” Sprint back and forth between the cones for 6x lengths or 3x round trips. Touch the line at each turn. The faster you finish, the more rest you get before the next round begins.